Our gallant 4th grade side has fallen just short of becoming the first Waratahs grade side in our history to win back to back premierships. It was a disappointing result in what was an amazing season once again for Adam Gummer’s team. The match showed the quality of cricket as well as the spirit that the team played, coming very close to pulling off a miraculous victory. Congratulations to St George on winning the 4th Grade Premiership,. Also a big congratulations to Penrith on winning 1st grade, Sydney Uni in 2nd Grade, Easts in 3rd Grade, Sutherland in 5th Grade and Parramatta in Brewer Shield. There couldn’t be any other winner this weekend. Despite being in a losing side, Josh Wigney took out the David Givney Medal for the best player in the 4th grade Grand Final. He was head and shoulders above all other bowlers in a match that was batsman friendly. This was despite going wicketless on day 1. He brought the team back to give them a realistic chance of victory through being persistence and patience. As a result, Josh is our 4 Pines Player of the Week. After some heavy showers on Saturday morning, we turned up to Hurstville Oval hoping that we would be able to get a good bit of cricket in. To our delight, the ground looked amazing. However, our delight turned to dismay as the groundsman decided to spill the surface water from the covers onto the edge of the square. As a result of this there was a big puddle of water and play was delayed by 3.5 hours. Play was eventually scheduled for a 2pm start time. Sipper Adam Gummer won the toss and owing to the loss of overs, decided to have first crack with the ball. However this was the only bright spot for the rest of the day as the St George openers stood tall under pressure and built a healthy opening stand. They finished Day 1 on 0/159. We didn’t bowl as well as we could have but toiled hard none-the-less. 2 catches were put down which again goes to show that catches win matches. Day 2 however was a new ball game and we arrived at the ground knowing that we still weren’t out of it. 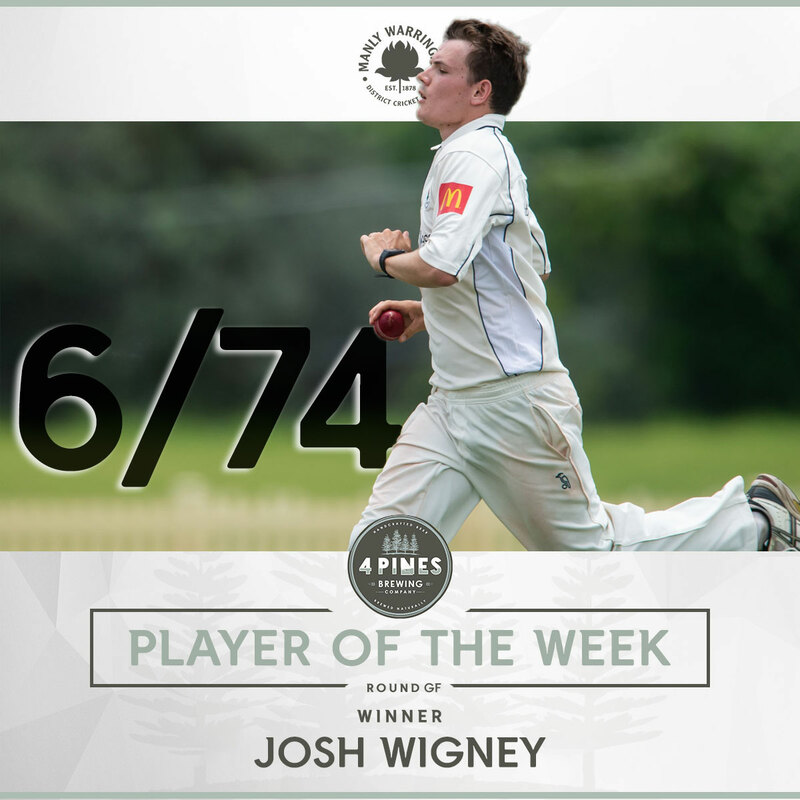 Despite the openers adding 20 more runs at the start of the day, Josh Wigney started us off with 3 quick wickets to get the ball rolling. From 0/170 to 3/178 in an instance. From here it was a continual procession of wickets throughout the morning, mainly led by Wigney. He bowled superbly and really lead from the front. His pace and bounce were good all innings and he moved the ball both ways to always be a threat. 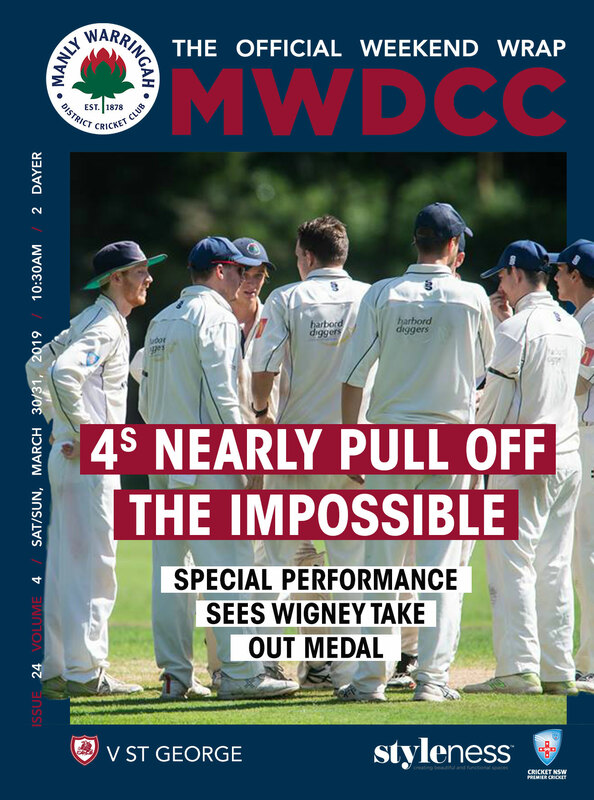 With 2 wickets from Andrew Somerville (and yes one to Jordan Daly as well) we eventually bowled them out for 324, leaving us 51 over to get the runs. A draw would do us no good as St George would gain the premiership as a result of their higher placing on the ladder in the regular season. Well, we gave it a crack. Adam Gummer (60) was huge at the top of the order and after a 1st wicket stand of 58 with Nick Cohen (27) we had set ourselves a platform. Joel Davies played a gem of a knock with 53 off 46 balls to support Gummer, but it was Will Akhurst who played the innings of the day, blasting 65 off only 46 balls. He hit the ball to all corners of the ground in a brutal display of batting. Everyone who saw it are convinced that Will should play in this unshackled way every time he bats. It was magnificent. When Will got out at 260 we were 7 down with still 65 to get off 8 overs. The boys went down swinging but ultimately the target was too much for us, and we were bowled out for 293 in the 48th over. All in all a great season for the 4th grade side. To reach the decider 2 years in a row and come very close to winning back-to-back premierships is an amazing achievement. Adam and his team should be very proud.